Wasp stings (or yellow jacket stings) are a cause of concern for many, especially during the Summer months. Here is some guidance on what to do to treat a wasp sting, and also preventing stings in the future - most of these tips are very simple measures you can take. At the end of this post, I also include a short review of some of the (deet-free) products available out there to help repel wasps and other stinging and biting insects, and a link to a further page for repelling wasps in specific situations. Treating wasp stings is very similar to treating bee stings. However, there is no sting to remove, as is the case should a sting be caused by a honey bee. Also, the composition of the venom is slightly different between wasps, bees and hornets, and so reactions to a stinging incident can be different, even though wasp sting first aid is similar to that for bee stings. 1. Wash the area with cool water. 2. Apply an ice cube or ice pack to reduce swelling or cold flannel. 3. If the sting is very painful or very itchy, apply a soothing lotion, such as calamine lotion, or a suitable cream or ointment containing an antihistamine or local anaesthetic. Ensure you read the label and only apply products that are appropriate for you. 4. An analgesic, such as paracetamol or aspirin, may also be taken if appropriate. Always read the label and remember there are restrictions for the taking of medicines in children, dependent upon age. Do not exceed the recommended dose. 5. If you are concerned, or if symptoms persist (for example, with major swelling), consult a health care professional. 6. If the sting has occurred in a sensitive area, such as close to the eye, nostril, ear, or in the mouth, consult your doctor immediately, or go to hospital. 7. If you begin to have difficulty breathing or swallowing, or find yourself wheezing or feeling dizzy call an ambulance or go to the hospital immediately. As with bees, a wasp sting reaction can be very serious. Although anaphylactic shock is rare, it is important to recognise that it can nevertheless occur. Likewise, should you experience any other symptoms soon after a sting, such as nausea and vomiting, stomach ache, diarrhoea, seek assistance immediately. 8. Note: If you find some-one experiencing anaphylactic shock following a wasp or other insect sting or bite (including mosquitoes or tick bites), check to see whether they are carrying an Epi-pen - they may need your assistance to administer the Epi-pen injection immediately, and then seek medical attention. If you are aware that you have an allergy to bee and/or wasp stings, ensure you carry an epi-pen with you at all times, and you could consider carrying a charm or pendant such as the one featured on the left, to alert people that you have an allergy. using their mouths in building their nests. Stings are the means of defence, and wasps will sting (rather than bite) when they perceive a threat. You may be tempted to splat or squash a wasp, but it is far better not to kill wasps because it you may only attract more of them. But why? On death, wasps release pheromones that act as a warning of threat to other wasps, hence you will risk provoking further attack. See the information below and the link to my new page about preventing wasp stings. Wasp Sting Treatment Or Wasp Sting Prevention? How can you ensure you are not stung by a wasp in the future? Below are a few tips for repelling and deterring wasps, with a link to further information - my new page concerning specific scenarios and more advice. But anyway, it obviously makes sense to avoid or prevent stings in the first place, rather than having to apply first aid measures, especially where young children are concerned. Use a deet free, non-toxic, natural repellent (see below for recommended items). Not only is this preferable around children, the elderly, humans generally, pets and the home, it's better for the sake of beneficial creatures such as butterflies, bees and hoverflies. Wasps are attracted to sweet sticky drinks and foods. Use a sealed drinking cup with a straw like this. This is especially important for children, and if going on a picnic. Also, try to opt for finger foods that can be popped into the mouth quickly whilst most of the food remains in a sealed container. Take wet wipes with you to clean around a child's mouth and also fingers, and paper towels to dry the areas afterwards. If possible, eat sugary items and fruit indoors, away from wasps. Learn not to panic. I have never, ever been stung by a wasp, and I am convinced it is because I do not feel fear, meaning that I release no fearful or angry chemicals (pheromones) from my skin that might be detectable by wasps. I don’t threaten wasps, and they don’t threaten me, even when I stand beneath a cotoneaster tree that is covered in them. That said, I am respectful, because I know stings can happen, but I do believe you are less likely to be stung if you keep calm, and do not wave your arms around. Move calmly and swiftly away from the wasp or wasps, and try to leave them alone. Unless you have provoked attack, usually if wasps are coming toward you it is because they are investigating - probably they are attracted to moisture or scent from something you are drinking or eating, rather than because they have decided to attack you. Teach children to keep calm and move away, and try not to encourage panic. Also, education about wasps, their value, and how they live, can encourage children to keep a respectful distance from wasps rather than fear them. My generation and the one previous, has been brought up to despise and kill (ultimately provoke) wasps. This needs to change - I believe balanced education would actually help avoid wasp stings! I strongly recommend the book on the left - 'A wasp builds a nest'. Keep your shoes on outdoors – at least, be aware of the risk of standing on a foraging or resting wasp which could sting your bare feet. If you have soft fruit trees close to a human seating area, wait until night, wear protective clothing and thick gloves, and sweep away any windfalls on the ground. Put them in a part of the garden where they will not cause disturbance. I think it's best to do this if you can, as this may help to attract them away from the seating area and your fruit trees, in favour of a place where the fruit is accessible elsewhere. You could add banana skins and apple cores for added temptation! Check your personal care products, such as deoderants. 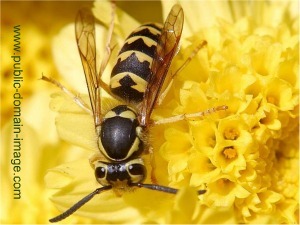 Wasps are attracted to acetic acids and alcohols that may be present in products. See this link. If you have the remains of a wasp nest around the outside of your house, I suggest you leave it in place. As I understand it from an expert, wasps are territorial. By leaving the nest there, it discourages other wasps from nest building, even if only a small amount of the nest remains. Left - Waspinators work by fooling the territorial wasp into thinking there is already a wasp nest present. Be sure to hang it in from the eaves of your house (or wherever you think they are likely to nest) early - before wasp nest season starts in your area. You can also take them with you on picnics. Invest in a Waspinator (pictured above), or see if you can make one - they are not very expensive to buy, but if you have appropriate materials at home, you may as well make it yourself. By far, this is in my view, one of the best wasp repellents, as (and supporting the point above about the 'territorial wasp') it prevents wasps building a nest in an inconvenient location, and can deter them from attempting to dine with you outside on a summer’s day. Waspinators look like paper wasp nests (arguably, they also look like hornet nests). They work, because, as stated, being very territorial, wasps naturally avoid sites where other nests are present. They can be hung in the barbecue area (away from naked flames) the loft, from the garden shed, or other areas, and will hopefully last for years if not damaged. If you want to discourage a wasp from building a nest, be sure to hang it up early enough - i.e. early in spring. They can also be taken on picnics and camping trips, and hung from parasols. They are excellent value for money (I do not recommend the paper versions which cost slightly less but are not so durable), and avoid the need for unnecessary inconvenience, expensive wasp nest removal services, and polluting pesticides that you don’t want near your children or pets. If I were concerned about wasps, I would probably keep at least one or two in place around the outside of my home or garden, and have a spare one for taking on picnics, eating outdoors etc. However, I have to say, I don't bother, because I like wasps. We've had a wasp nest in our garden for a couple of years, and we have the remains of an old nest in the attic - see the image below. We had no idea it was there until the wasps were long gone. So yes, I just ignore wasps, and let them get on with it, but not everyone can do this! I prefer to recommend natural products, but mostly, I'm keen that they should be Deet-free. NEW: Remove or repel wasps without killing them. 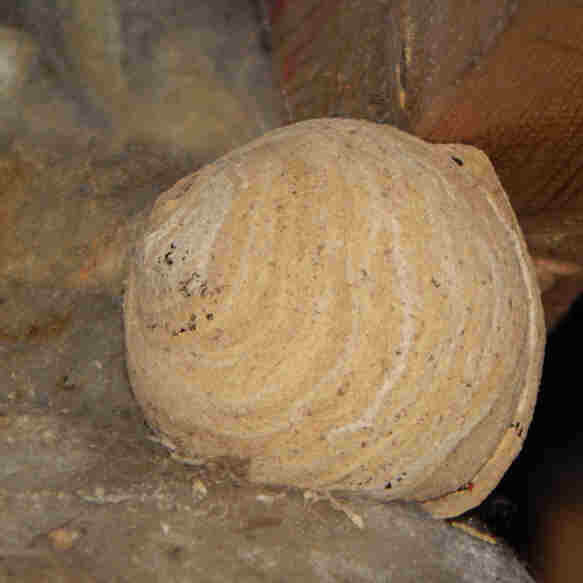 Go from Wasp Sting Treatment And Wasp Sting First Aid to this page of advice explaining what to do if you need to get rid of an existing wasp nest. Although this page is about natural and home remedies for bee stings, they can also be used in Wasp Sting First Aid too. Go from Wasp Sting Treatment And Wasp Sting First Aid to this page about about bee and wasp sting reactions. Go from Wasp Sting Treatment And Wasp Sting First Aid to information about the life cycle of the wasp. The humble yellow jacket wasp is an excellent pollinator and controller of aphids and other insects known to eat garden crops. It has a short life cycle, similar to the bumblebee or solitary bee, depending on the type of wasp. Go from Wasp Sting Treatment And Wasp Sting First Aid to information about bee stings.